Orchard Lanes Bowling Center is a non-smoking entertainment center offering an automatic state-of-the-art scoring system, video arcade, video poker and snack bar. Lanes are available for everyone, everyday of the week (some exceptions may apply). We even have bumper lanes for the kids so they can experience the thrill of knocking down pins regardless of age and ability. Orchard Lanes features a wide range of events and party options for every age. Celebrate a birthday, holiday or just because. Treat the whole family to a night out with one of our many open bowling specials. Saturday nights feature Thunder Alley Bowling - the lights are out and the music is up! Reservations are accepted. We have every kind of bowling league for your enjoyment. social and competitive leagues run in the mornings, afternoons, and evenings. Let the good times roll and "Go Bowling Today". We guarantee you’ll have a strikingly good time!! Please note: open play lane availability subject to scheduled leagues and events. 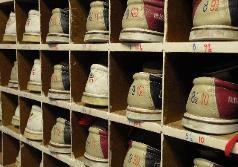 Reservations accepted at $12 per person for 2 hours of unlimited bowling, including shoe rental. Reservations are held for 10 minutes. Please call with questions or for more information. Reservations accepted at $12 per person for 2 hours of unlimited bowling, including shoe rental. Reservations are held for 10 minutes. Please contact us at 541-386-1326 or click here to reserve your lanes. No matter the occasion, Orchard Lanes is the perfect place to hold your next party. With many packages to choose from, including custom corporate party options, your guests are sure to have a strikingly good time. Orchard Lanes offers special bowling deals for nearly every day of the week. With games and shoe rental as low as $1.25, you're guaranteed to have a strikingly good time! Orchard Lanes Bowling Center is a non-smoking entertainment center offering an automatic state-of-the-art scoring system, video arcade, video poker and snack bar.